Holly Ann Scoggins is a North Carolina native and recent resident of New York City. Scoggins (formerly Holly Sailors) received her Bachelor of Fine Arts in Painting and Drawing from East Carolina University, and a Master of Fine Arts in Painting and Printmaking from the New York Academy of Art. Scoggins also studied at Savannah College of Art and Design, Penland School of Crafts, Lamar Dodd School of Art in Cortona Italy, and at the Liepzig International Artist program in Germany. Her paintings and prints are included in the permanent collections of The University of Georgia, Chanel Fine Art for Boutiques, the BMW and LIA International Artist Collection, and more. Featured solo exhibitions include Berkeley Gallery, NYC in 2010, and at the Spartanburg Museum of Art in 2009. Recent shows include a figurative exhibition at the International Trade Center in Shanghai, and the Interfaith Biennial at Dominican University. 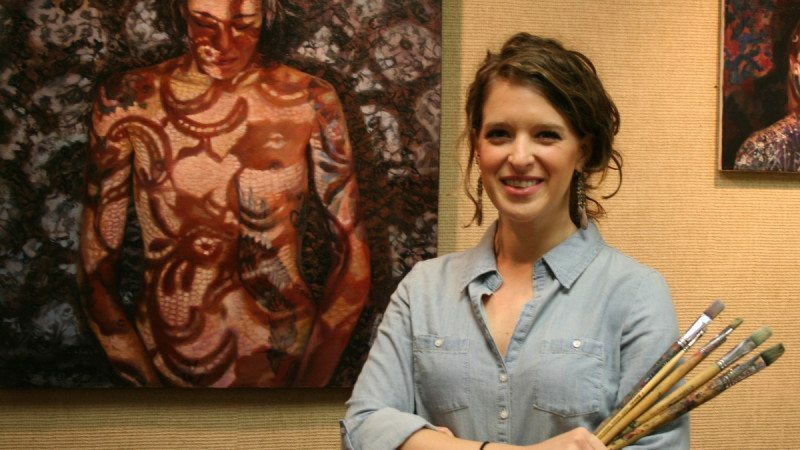 Her work has been exhibited at Sothebys, Flowers Gallery NYC, the National Arts Club, and the 2012 Southeastern College Art Conference. You may see more of her work at hollyannsailors.com. Before landing at Polk State College, Scoggins was a graduate teaching assistant and taught courses at Emerge Gallery and Art Center, The New York Academy of Art, and Long Island University in Brooklyn. Professor Scoggins teaches Drawing I, II, III, Painting I, II, Figure Drawing, Portrait Painting, and Design.